Spates’ address was largely an analysis of U.S. v. Regenerative Sciences, a recent decision in which the United States District Court of the District of Columbia held that a procedure using adult autologous stem cells should be regulated by the FDA, based on the rationale that it amounts to the use of a drug. 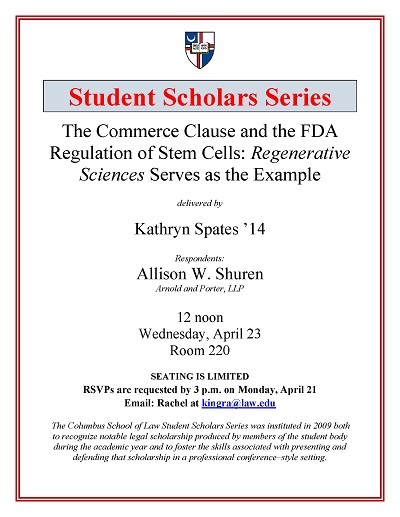 Spates, Kathryn, "The Commerce Clause and the FDA Regulation of Stem Cells" (2014). Student Scholar Series. 21.